A Pittsburgh Plumber LLC Laundry Room Plumbing Page. Laundry Room Plumbing Services for all of Pittsburgh. Laundry rooms are often overlooked or put off as a remodeling project, but we spend a considerable amount of time doing laundry. Why not maintain or upgrade your laundry facilities to better enjoy this task? Have a clogged drain in your laundry room? Have you tried to unclog your drain with over the counter drain openers but been unsuccessful? 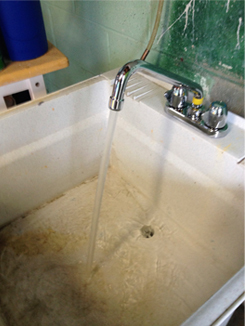 Get results from our laundry room drain cleaning experts at A Pittsburgh Plumber! Call Us Before You Dump money into chemicals which can harm your pipes and make the damage worse. Laundry Room Plumbing and Drain Cleaning may not sound technical, but to be done right it is. From time to time laundry room drains clog from lint, soap buildup and due to material failure, food and waste, and grease and oil in clothes. Pipes get clogged from time to time. Rest assured when you call A Pittsburgh Plumber at (412) 341-7586 you will receive quality service and fair pricing. Our 50 plus years of experience has taught us that most drain clogs can be opened in about an hour. Don't be fooled by the big box plumbing companies who come in and say that they need to open up your wall or floor to replace pipe before inspection is completed. As mentioned before we are able to open more than 90% of the drain clogs that others can't or won't. Call The LAUNDRY ROOM PLUMBING EXPERTS at A Pittsburgh Plumber for professional Pittsburgh Laundry Room Drain Cleaning! A quick upgrade for your laundry room is to replace the laundry tub sink faucet. Central Brass, Moen, American Standard, and a host of other faucet manufacturers make solid replacement faucets to get your laundry room plumbing project started on the right foot. Moen deck mount laundry tub faucet pictured. Many old cement laundry tray or laundry tub set-ups exist in our homes to this day. Drain and trap parts have become expensive and cumbersome when a plastic trap serves the purpose just as well and won't rust over time. Replacing the laundry tub and faucet trap and drain will have you well on your way to a fine laundry room plumbing upgrade. Having proper shut-off valves is a must in any laundry room project. These valves can be a lifesaver if your supply hoses fail and are necessary in the event you decide to upgrade your washing machine. Seperating different areas of your home with segmented water supply shut-offs is always good form. This way service can be performed on parts of the water supply system, like your water heater, without shutting down the whole house or property and causing undue inconvenience for residents or tenants. 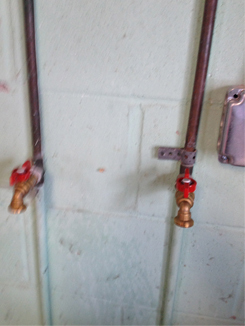 Having these supply valves tested, if they even exist, is a must in any laundry room plumbing project. If the shut off valves don't exist, have them installed. If they are faulty or leaking have them replaced.